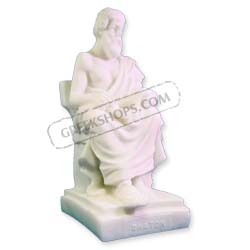 GreekShops.com : Greek Products : Miniature statues : Plato Alabaster Statue 5"
[Code : HG_Plato_02] Plato Alabaster Statue 5"
Plato was a Classical Greek philosopher whom, together with his teacher, Socrates, and his student, Aristotle, Plato, helped to lay the philosophical foundations of Western culture. Plato was also a mathematician, writer of philosophical dialogues, and founder of the Academy in Athens, the first institution of higher learning in the western world. Plato was originally a student of Socrates, and very much influenced by his thinking. Plato's brilliance as a writer and thinker can be witnessed by reading his Socratic dialogues. Some of the dialogues, letters, and other works that are ascribed to him are considered spurious. Interestingly, although there is little question that Plato lectured at the Academy that he founded, the pedagogical function of his dialogues, if any, is not known with certainty. The dialogues have since Plato's time been used to teach a range of subjects, mostly including philosophy, logic, rhetoric, mathematics, and other subjects about which he wrote. About 5 inches in height.